A new thing we are doing with our blog is featuring the history of the towns we provide our hardwood flooring services to. Today we’ll be talking about the history and background of Franklin, NJ! 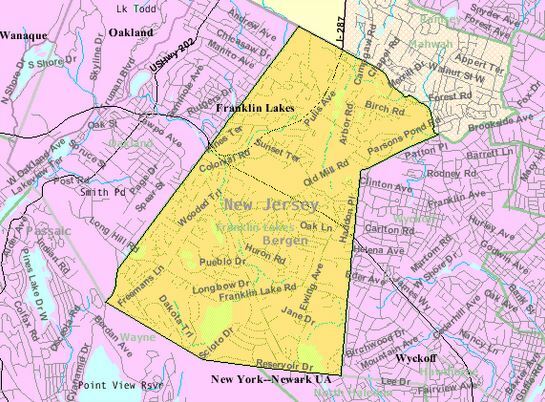 The borough of Franklin Lakes is located in Bergen County, NJ. During the seventeenth century, the Lenape Indians arrived there and set up camp close to Buttermilk Falls, in the “Clove”. While there, they fished in Franklin Lake which, back then, was called Micharagrape Pond. Gradually, Dutch settlers traveled west from the valley of the Hudson River. In 1701, Michael Hawden acquired the land surrounding the pond from the proprietors of East Jersey. In 1772, the township of Franklin was established, which encompassed the majority of north west Bergen County. Many of the early inhabitants were farmers. Primarily, these inhabitants were Dutch, with names such as Van Blarcom, Van Houten, Van Winkle, Pulisfelt, Ackerman, etc. They constructed sturdy farmhouses of fieldstone and sandstone. To this day, fourteen of these historical houses still survive. Mills appeared along the creeks: gristmills, sawmills, forges and tanneries. On Franklin lane, the Grist Mill owned by Daniel Youman was the first business to open. Subsequently, this served as a cider mill and saw mill. According to the Walker Atlas of 1876, Franklin Lakes had roughly five mills, one-hundred residences, three schools, one tannery, one church, four wagon and blacksmith shops, one store, two railroad depots and two hotels. In 1869, two railway stations were constructed, when the Midland Railway of New Jersey was expanded to Oakland. One station was built on Pulis Ave, at Campgaw. The other station was built on High Mountain Rd, at Crystal Lake. Residents caught the train to commute, and to transport mail and goods. With the arrival of the twentieth century, mansions and estate houses appeared in the borough. The industrial revolution generated wealth, and many wealthy people became “gentleman farmers”, who only lived in the borough over the summer. Some of these properties include the Post Terhune residence on Franklin Lake Rd, the Atterbury Brockhurst residence on Ewing Ave, and the Bartholf Hughes residence on Somerset. Ultimately, the Campgaw area became the borough’s civic center. During 1922, Franklin Lakes became independent from Franklin Township and elected its’ first Mayor, William Pulis. Edward May constructed three lakes and set up the Shadow Lake Swimming Club, which grew into the Shadow Lakes Estate. On the borough’s opposite side, J. N. McBride bought land surrounding Franklin Lake, and started building single family houses in Urban Farms. In 1959, once Route 208 was expanded to Oakland, Franklin Lakes was easier to access, and there were over 8,500 residents by 1980. During the early nineties, Interstate 287 was completed. This triggered another construction boom. The 2000 census reported that the borough had a population of 10,422. Nationwide, Franklin Lakes ranks seventeenth amongst the highest income areas of the US, with a population exceeding 10,000. Over the years, the borough has developed from a quiet rural community, to a prosperous metropolitan suburb. It continues to be a great area to live and bring up children. Do you live in Franklin Lakes, NJ and need a quote on a hardwood flooring project? Contact us today.